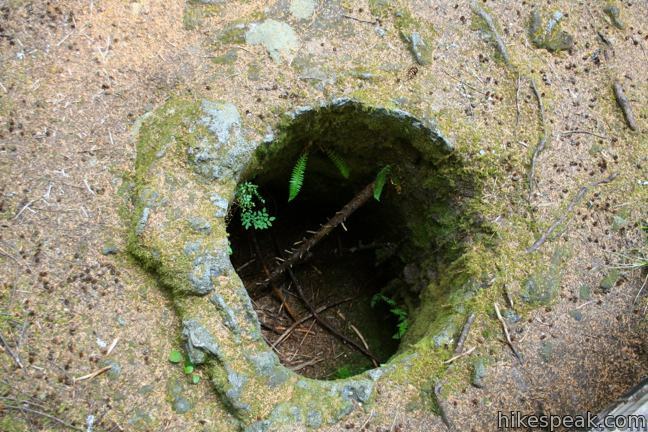 Trail of Two Forests offers a window into two time periods of forestation shaped by nearby Mount Saint Helens. 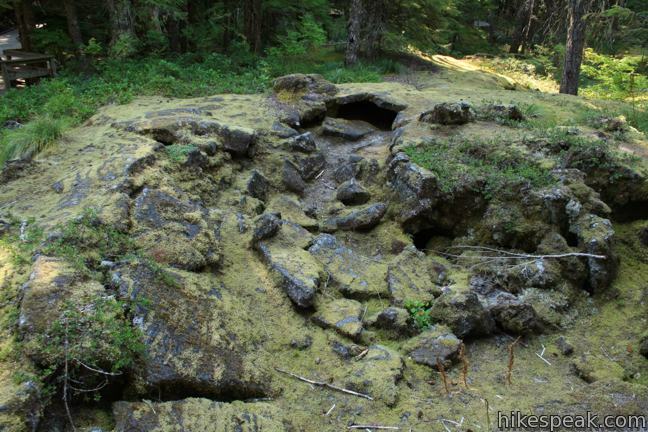 The current forest is obvious – moss, fern, trees, and fighting shrubs that have regrown over lava that covered this land approximately 2,000 years ago. The second forest is ghosts of trees that once stood here. 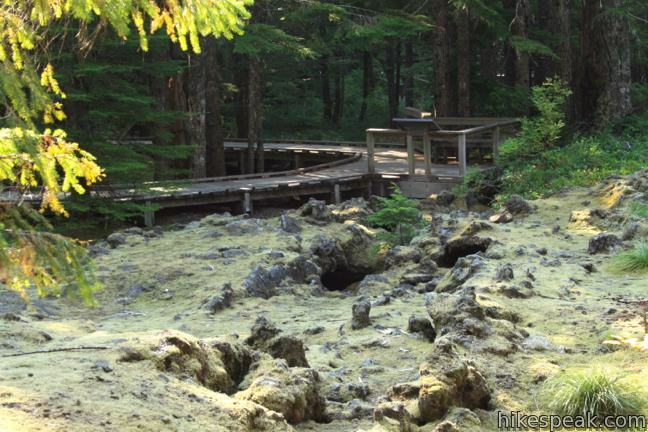 As slow-moving molten lava cooled, it surrounded trees and began to harden. Because of the extreme heat, the trees burned to the ground, leaving hollow trunk-shaped holes in the now firm lava. 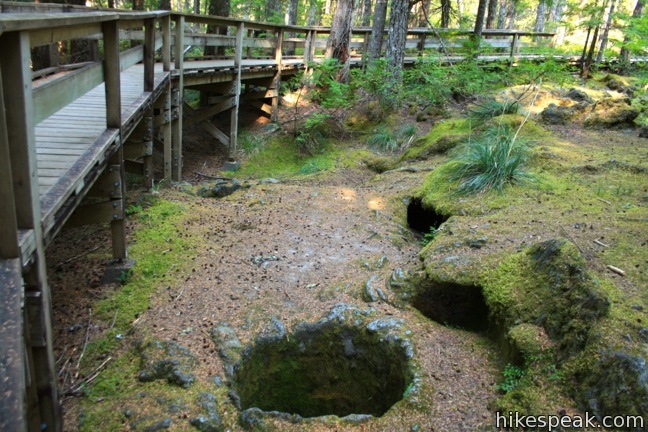 You can observe both forest on this 1/4-mile loop, which includes an optional crawl through a narrow fifty foot lava tube. It’s a trip! Set out on the nature trail, which provides illustrated panels to explain how this forest was transformed. 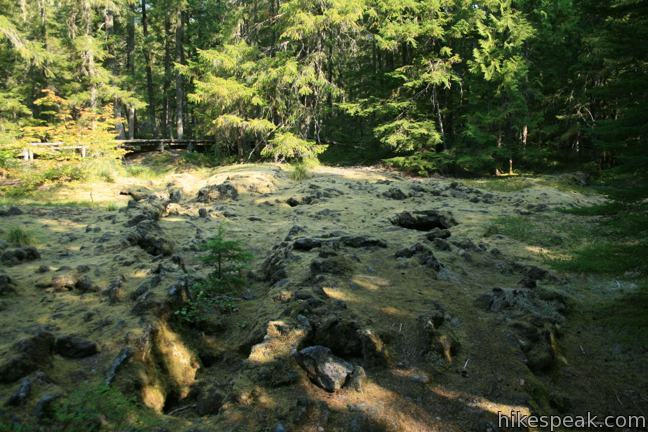 This woodland stood at the end of a slowing flow of molten lava, a rare form of eruption for volcanoes in the Cascade Mountains. (Mount Saint Helens explosive eruption in 1980 is a good example of how volcanoes in this range typically erupt.) 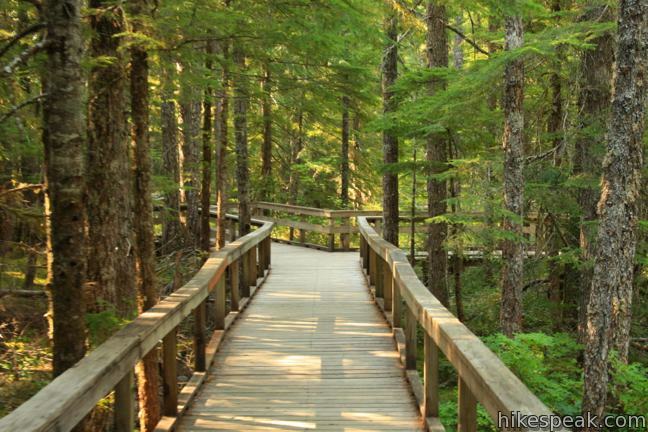 A short distance up the boardwalk, make a right to follow the loop in a counterclockwise direction. You will pass several lava-made molds of trees that no longer stand, as well as greenery that is reclaiming the less than hospitable terrain. The level boardwalk is wheel-chair friendly, excluding the voluntary subterranean excursion at the end of the loop. 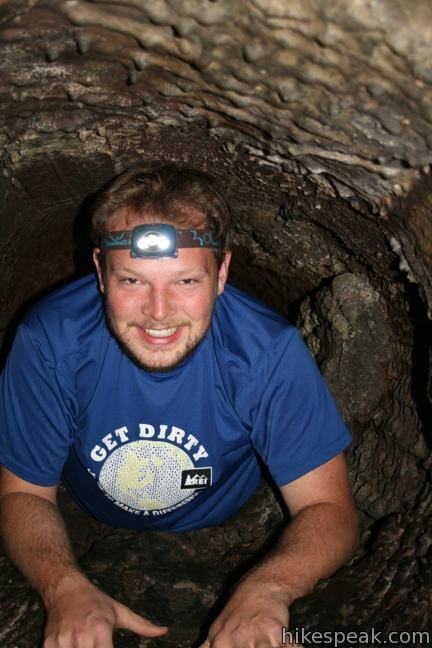 To get your lava tube on, climb down the short ladder into a dark hole at the beginning of the tunnel. 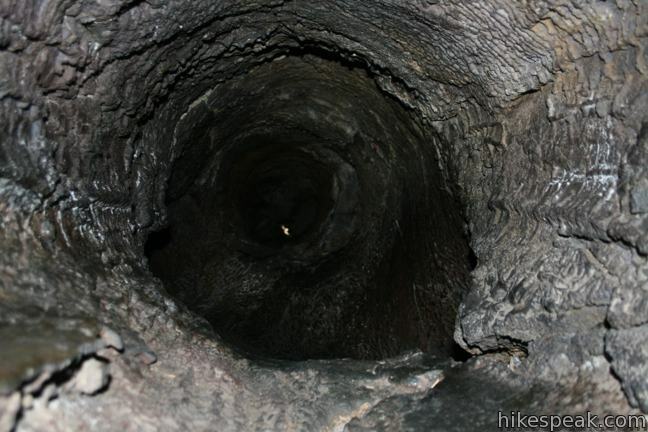 A flashlight is handy, but not required as you inch your way through the L-shaped shaft formed by two fallen trees. 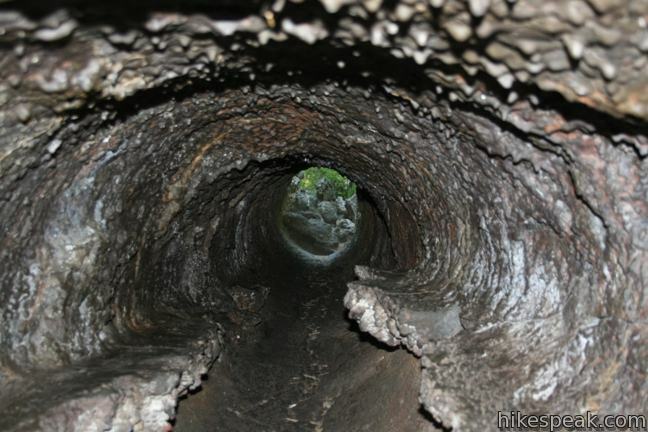 While crawling on your hands and knees, you will notice that the tunnel walls are covered with ribs and cracks matching the bark of the trees that once filled this space. Luckily for your head, much of the ceiling has been glazed by the wood fire that burned in the tube. Thirty feet in, you will make a turn to the left and see the light. A ladder at the end of the crawl will bring you back up to the boardwalk. Don’t be surprised if children rename this the Trail of Too Much Fun. 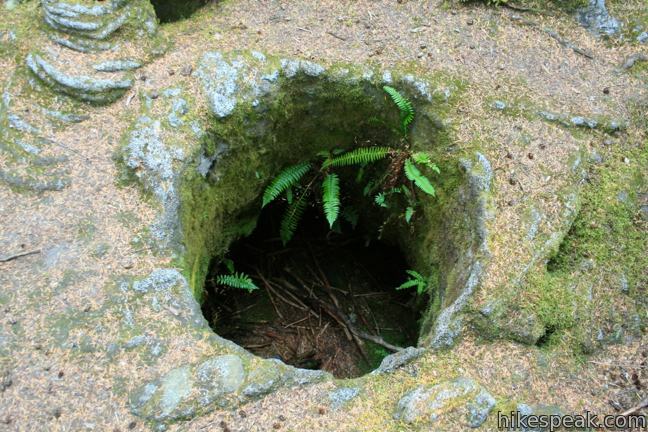 Spend more time underground by visiting nearby Ape Cave Lava Tube. 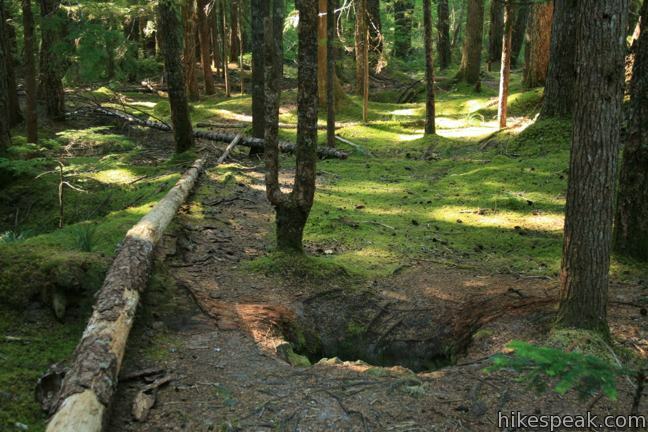 Trail of Two Forests is an interesting short hike in Mount Saint Helens National Volcanic Monument in Gifford Pinchot National Forest. Dogs are allowed on leash. There are picnic tables and bathrooms at the start of the trail. 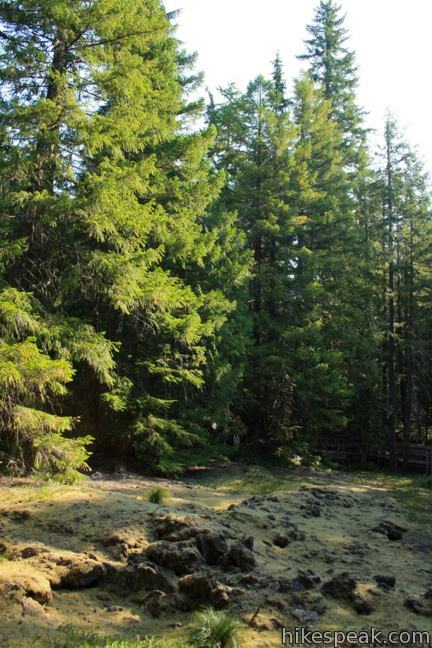 A Northwest Forest Pass is required to park at the trailhead. 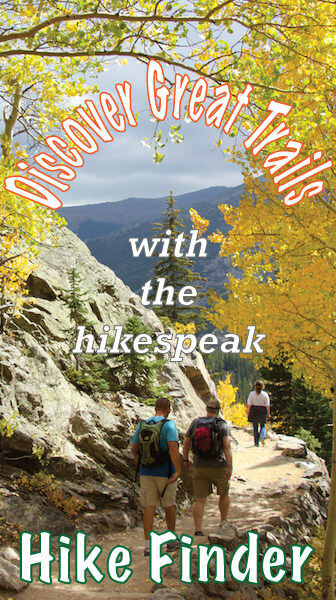 You may self-register for the $5 day pass at the trailhead. An annual America the Beautiful national parks pass can also be used in lieu of the regional national forest pass. To get to the trailhead: From Interstate 5, 140 miles south of Seattle and 25 miles north of Portland, take exit 21 on to Route 503 East toward Cougar. After 35 miles, turn left on Forest Service Road 83 and drive two miles north to Forest Service Road 8303. Turn left again and drive 0.2 miles to the trailhead parking area on the left, before the Ape Cave parking area. 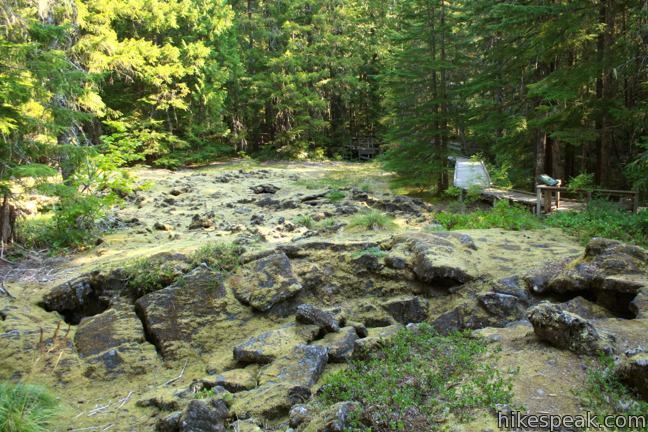 You may also view a regional map of surrounding Washington trails and campgrounds. Wow such an interesting expierence! 10/5 would recomend! Watch out for bears and evil birds that will take your lunch! i really liked crawling through “the crawl” a really good one for the kids, They totally loved it! exept for when you get lost and stuck for 3 hours it is very hard and you get lost easily. WOOOOOOOOOOOOOOOOOOOOOOOWWWWWWWWWWWWWWWWWWWW!!!!!!!!!!!!!!!!!!!!! you must have had so much fun!!!!!!! i had fun toooooooooooooooooooooo!!!!!!!!!!!!!!!!!!!!!!!!!!!!!!!!!!!!!!!!!!!!!! the bestest family trip i have taken in years!!!!!!!! My kids favorite part was the crawl where you crawl in the rock tunnel!!!!!! be careful though!!!!!! my son franchesco got stuck in the crawl and could not find his way out for over 2 hours!!!!! the crawl is a lot of fun my sonmarquavious said that it was the best experience he had ever did!!!!! it is very tricky to find your way out and is very easily to get stuck!!!!!!!!!!! I rate this 999999999999999999999999999999999999999 out of a 10 because i loved it so much and my kids loved it to even my wife laskwanka who doesnt like outside likes is as well!!!!!!!!!!!!!!!!!!!!!!!!! so much fun would come again!!!!!!!!!!!!!!!!!!!!!!!!!!!!!!!!!!!!!!!!!!!! !